That, in a nutshell, is the storyline of The Sarah Connor Chronicles, the TV extension of the classic Terminator film franchise. The show stars Lena Headey as Sarah Connor, Thomas Dekker as John Connor, Summer Glau as Cameron, and Richard T. Jones as Agent James Ellison. I’ll be honest when I say that I never thought a TV show based in the Terminator world would be good. Being a fan of the films, just like every other guy on Earth, I worried that the legacy of the films would be tarnished by an underproduced TV show. Thankfully, my fears proved to be false. I was pleasantly surprised by The Sarah Connor Chronicles‘ non-stop action, involving storyline and production value. The show starts off with a bang and doesn’t let up, not wasting any time setting up the entire backstory of the franchise before shifting into high gear. The show is well written and directed with great pacing and a great ensemble cast lead by Lena Headey’s wonderful performance. The box set includes all nine episodes of the first season, which was unfortunately cut short due to the writers’ strike. Episodes are presented in 1080p 16×9 resolution and look really good for the most part. There are a few scenes in certain episodes where the colors are either over saturated and blown out or a bit washed out. This, however, doesn’t take away from the viewing experience and as a whole, the show looks great in HD. Unfortunately for those with a great home theater system, the show’s audio is only presented in Dolby Digital 5.1 – enough for the non-techy consumer but a disappointment for the audiophile. Bonus features include: audio commentaries, deleted scenes, cast audition tapes, gag reels, storyboard animatics, a Summer Glau dance rehearsal and Creating the Chronicles, a three part look at the series’ production process. Unfortunately the only bonus feature presented in HD is the 40 minute long Creating the Chronicles. Overall, I greatly enjoyed the show and was immediately hooked. The Sarah Connor Chronicles delivers the total package and is highly recommended for fans of the Terminator franchise and for those looking for an entertaining, action packed drama to counter the sickening number of reality shows infesting network television. 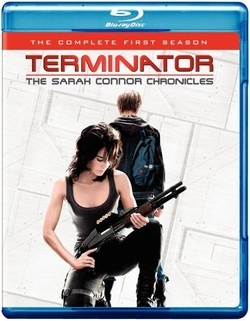 Terminator: The Sarah Connor Chronicles is available now on DVD and Blu-ray.